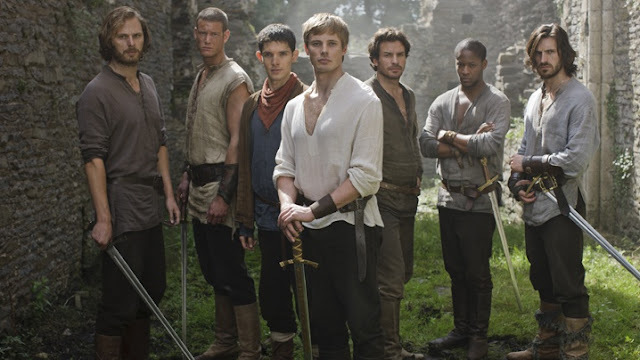 At Christmas, Merlin, the fantasy TV series following a young Merlin, Arthur, Guinevere and Morgana fulfilling their destiny, finished its 5 year run. At the time I got distracted (wallowing in angst over the end) and didn't review it, but my little cousins finished it on the weekend and I felt compelled to write a review of the series as a whole. Please understand, I love Merlin. I really really love Merlin. I think there are things they got wrong, but there are wonderful, family centric elements to the show that will always shine. I watched this show with friends, family, kids, adults, and in one case, through a really hard time in my life. I've converted more than a few people and had many good times because of it. If you love magic, fantasy and a family style show, then Merlin's for you. We all know the ultimate story of Arthur and Merlin, so I'm not going to delve into it here. What Merlin did well is progress arcs while still having entertaining weekly episodes that were self contained. It focused predominantly on the character relationships and that was its greatest strength. For my series review I'll look at important relationships and their development before a breakdown of the series finale. The Merlin and Arthur bond was simultaneously the best and worst thing about Merlin. Every year we'd watch the two of them grow close, share personal stories and moments, become trusted allies, and every first episode of the next season the relationship would reboot. Arthur would be a jerk to Merlin, Merlin would mope, it was frustrating. For long time viewers of the show this was something that was never allowed to grow. But the worst instance was the change between seasons one and two, because they really had gotten incredibly close in the first season. I don't think they were fully allowed that ever again and so while there are episodes that I adore, I feel cheated of the whole relationship. 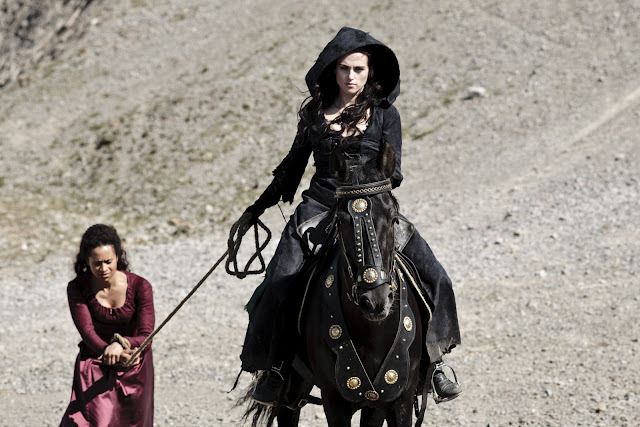 At the beginning of Merlin, Morgana is the King’s Ward and Gwen her serving girl. I cannot actually describe the joy this relationship brought me (no really, I just got wibbly looking for images). I loved it. Morgana would go in to bat for Gwen at every turn despite the consequences. Gwen supported and cared for Morgana. As the series progressed it's obvious this would end, what with Morgana wanting to kill Arthur and Gwen being in love with him. But even in the last season, while Gwen was locked with Morgana in the Dark Tower, I truly believe Morgana wanted that friendship back. It was one of the few female relationships that passed the Bechtel test and the friendship was non existent towards the end. This was necessary I understand, but allowing them to be friends a little longer would have been good. Oh the pain. I have issues with this relationship. Issues because they were amazing friends and because Merlin created the monster that Morgana is said to have become. He didn't mentor and support her as her power manifested. In fact, at one stage, he poisoned her instead of helping her. Gaius is to blame for this too, but I expected better of Merlin. In many ways he fulfilled her destiny by letting her, making her, his greatest rival and enemy. But their beginning was pure magic. Here's a relationship that was really interesting in the first season. In season one there were only two instances that Gwen and Arthur as a potential couple sparked felt natural. They barely knew each other; Gwen had only registered for Arthur as Morgana’s servant and Gwen was more interested in Merlin at the time. But in those two instances they were equals and this foreshadowed the beginning of a relationship of equals. My favourite scene between the two of them to this day was in season one, where they were not remotely interested in each other, but Gwen pulls Arthur up on his attitude towards the food that the villagers of a poor village have given him. She quickly indicates that she is sorry for speaking that way to a Prince, but Arthur looks at her with respect and admiration, because she was not only right, but brave for saying what she did. The second season was so forced it almost ruined the relationship’s development completely. Gwen's clothes were getting more provocative as she became more 'desirable' which was lazy and insulting writing and costuming. They have a lovely run in season 3 and 4 before Gwen becomes Queen, loses all personhood and they treat her as they did Morgana in season 2, like she wasn't there. Disappointing. A consistently sweet and supportive friendship from the first episode until season 4's end. Merlin and Gwen have a relationship of equals, her often being enlisted to help with his plans. I wish he had trusted her with his secret because that could have been amazing, especially in light of Morgana, but it never happened. In fact, in season 5 they lost that touch almost altogether. Interesting to also note that Gwen in season 1 had feelings for Merlin. These never lead to anything but set up the differences in the show. Merlin and Arthur both seemed interested in Morgana. If only. One of the best relationships in seasons 1 to 3, though especially in season 1, was Morgana and Arthur. The respect, integrity and tension were a joy to watch. This was before we discover that they are half siblings. But her betrayal stung more given their closeness and Arthur is devastated when he loses her, which was something they'd messed up in the past but certainly got right on some memorable occasions. He gets close to having a meaningful conversation with her about why she's doing what she's doing in season 5 but it never quite gets there, which is a regret of the series. 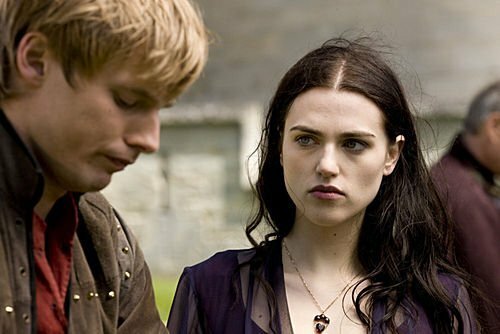 For the longest time Morgana watches Uther spread hate and injustice and she is the only one fighting him on it, encouraging Arthur to do the same. If she had stayed on that track, everything would be different. But her powers and fear, Uther lying about her half sister, Morgause's influence, discovering this man she hates was her father and that he wouldn't even own up to that on her potential deathbed was too much. Her betrayal, hurt, anger towards Uther was her ultimate undoing. Uther lied to her but it seems, loved her dearly and goes insane when he finds out she hates him. Another really great relationship, Lancelot is one of the very few people who know Merlin's secret and keeps it. The trust and friendship between the two if them is never replicated in the show and when it goes it is strongly felt. Merlin loses a friend and an outlet. He loses someone who truly knows him. There were hints that Gwaine might take this role over but as the seasons progress, Gwaine becomes more a typical knight and Merlin continues without a confidant. As the story goes, Gwen cheats on Arthur with Lancelot. Given how likable both characters were, it was important to get this right. In the beginning stages, their feelings were clear before Arthur was on the scene. When he potentially has feelings for her, Lancelot puts the future King’s feelings ahead of his own and leaves. Once he returns and she is with Arthur it's clear he loves and respects her, but that she is 100% in Arthur's camp. He makes a promise to protect Arthur to Gwen which results in him sacrificing himself for Arthur in an unexpected twist. How did they cover the Lancelot/Gwen betrayal then? Morgana raised and enchanted his spirit and put an enchanted bracelet on Gwen. They only kissed but Arthur banished Gwen. She dealt with it all very well, considering neither of them ever learns she was enchanted, but this way both Lancelot and Gwen maintain trust and integrity in the audience’s eyes, which is integral for such emotionally important characters. Man. What a pair Anthony Head and Bradley James make. Father and son grow throughout the series; one becomes more terrifying while the other shines and becomes a king of legend. 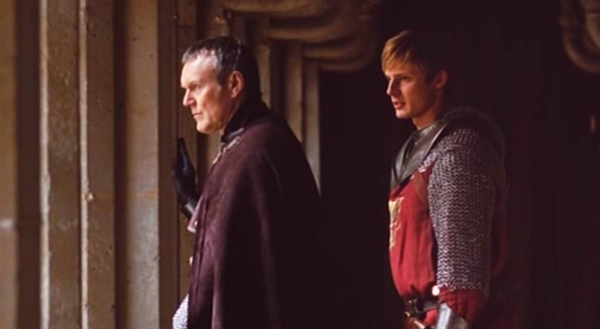 The season 5 episode where Arthur visits Uther's spirit solidifies Uther as an evil and vindictive character and Arthur as the true King of Camelot and legend. Unfortunately, the major reveal of season one, that Uther had used magic to have Arthur in the first place and that his wife Igraine paid with her life, was never completely revealed to Arthur. In one episode he discovered this and Merlin told him it was a lie to stop him from killing Uther. It's a real shame he never learnt the truth because it really seemed that information was going to set him on the path to Albion. It never happened. 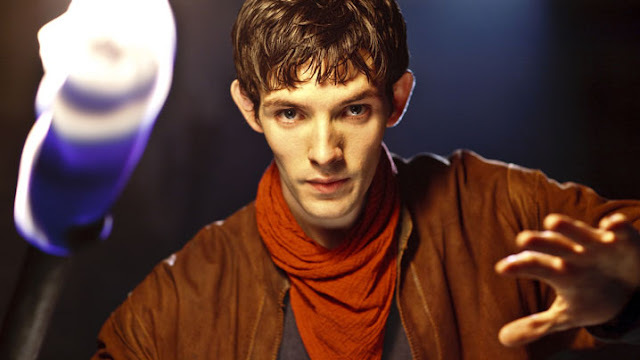 As Merlin's mentor, Gaius provided support, guidance and a father figure to the young warlock, something that many other characters, particularly Morgana, sorely lacked. 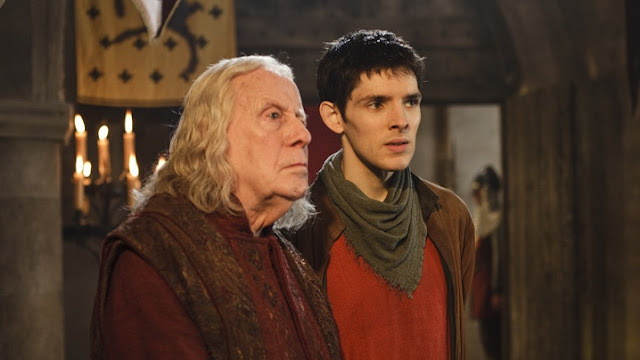 As the series went on, Merlin's relationship with Gaius was often the thing that stopped Merlin from going off the deep end, though in later seasons, Merlin's progress into adulthood was marked by him being right when Gaius warned him against something. Mordred, the druid boy who was prophesised to kill Arthur, came to the series early in the piece as a young boy. Morgana helped save and protect him, forming a close bond that was later rekindled when Morgana discovered her powers and went to the Druids for help. In season 5 we meet a grown up Mordred who senses that Morgana, who used to be full of passion and kindness, has fallen too far. He betrays her and becomes a knight of Camelot, forming a close bond with Arthur. Morgana never gives up her connection with him though and when Arthur has his Druid love executed, he turns on Arthur and is welcomed back to Morgana, telling her who Emmeris is - Merlin. I think for the most part the knights were a welcome addition to the show and definitely added to the legend. Their individual introductions warmed the audience to them. Lancelot as the hard working commoner who wanted to be a knight. Gwaine the rogue who didn’t want to be a knight but wanted to protect Arthur. Elian, Gwen’s wayward brother finding his place. Leon, ever reliable and a constant of the show. Percival, introduced by Lancelot and the muscle of the group. Seeing the round table in all its glory was fantastic, but the knights didn’t really develop into three dimensional characters, which is a shame. Of course there was a little more time given to Mordred and his growth and training, but over the course of a season, with so many complexities in the character, it was a little hard to achieve. So where did all these relationships go in the end? What did the show decide to focus on and how did it deliver? If I could sum up the Merlin finale in a sentence it would be that the finale hit all the right spots, but definitely felt rushed. I just wanted more. More time to spend with these characters when the real issues had surfaced. Because really important things happened, but they were crammed into a 40 min episode and didn’t get explored in the same way that they could have been in a season. One example of something that would have benefitted from a season arc was Mordred’s character evolution. In the same season that he comes back, becomes a knight of Camelot, wins the trust and respect of Arthur and believes in him as a King, he is instantly turned by the killing of a ‘love’ of his, that was not explored or believable. That hate would have been more believable festering over the course of a season for his ultimate revenge. Maybe they were worried about demonising him when he’d been popular (they had no problem doing that to Morgana) but it felt strange as a result. The major things that happened in the episode start with a final battle. At this battle, Merlin appears as ‘old Merlin’ and aids Arthur’s men. Arthur sees that a sorcerer is helping him. Then Arthur is stabbed by Mordred. There isn’t any big battle between the two; he is stabbed and in turn stabs Mordred. Like an unspoken and inevitable truth. Mordred dies almost immediately, while a piece of the enchanted blade, lodged in Arthur’s body, prevents him from being healed. As referenced above, this battle, this killing of two very important figures just didn’t get enough time and relationship lead up. Mordred hadn’t stewed enough for the act to be believable and Arthur hadn’t spent enough time in reflection to be resigned to his fate. It just seemed rushed and abrupt and emotionless. Merlin’s care of Arthur after he was stabbed, trying to take him to an enchanted water body to save him, and his confession to Arthur that he was a sorcerer was anything but emotionless; it was everything we had been waiting 5 years to see. Tearfully, desperate, Merlin reveals his secret to Arthur who is both dying and furious at being deceived. The fury of course, comes from a place of deep betrayal and hurt. That he had trusted Merlin and had been blind to what was actually going on. More so, he is hurt that Merlin ever thought that he would execute him, had he known. Merlin simply says he never wanted to put Arthur in that position. The discussions move through anger, betrayal, questioning and acceptance and the two journey on. 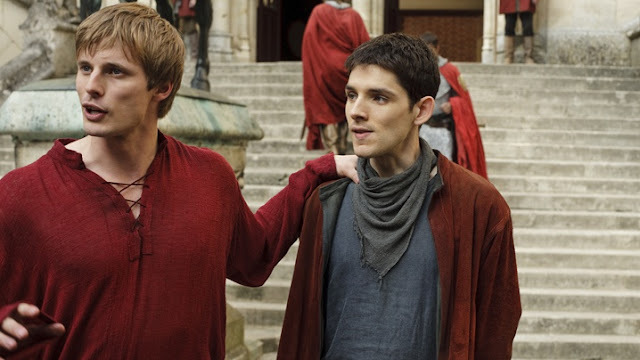 Colin Morgan and Bradley James do an incredible job of conveying all of the emotions, all of the hurt and regret and love that come out of the characters in this situation. It’s a bonding that was long overdue. 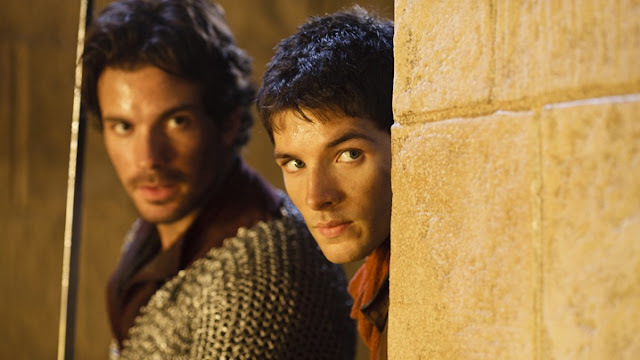 Along the way, Gwaine and Percival attempt to kill Morgana and are caught. This leads to the torture and execution of Gwaine by Morgana. These scenes serve as a vehicle for Morgana learning that Arthur has survived the battle and discovering his whereabouts, but in terms of plot development for Gwaine and Percival, do very little. Gwaine goes after her, not for his King, but a girl that he has developed (strangely intense and rapid) feelings for who has been betraying them all. Ridiculous was all I could think at the time. Nonetheless, they go out for revenge, and Gwaine is killed, to raise the stakes, and Percival escapes, though to what end is never explained. Morgana also buries Mordred in what could have been a much more touching scene if they had spent more time together and rekindled the relationship they shared in earlier seasons. When finally Morgana catches up with Merlin and Arthur there is a revelation, one that we have been waiting a long time for. Regret from Arthur, in the tired way he addresses her, and the fact that he realises there is nothing more he can say – though this idea has never come to full realisation given that the two of them were very close and her betrayal stung him almost as much as his father. At the beginning of the season he seemed like he was trying to understand, but again fell short. Additionally, FINALLY, Merlin acknowledges the part that he played in making Morgana the person that she is. In not actually helping her. In creating the monstrous parts. It’s two seconds though. Two seconds and just as her face softens, just as you think they might finally have the conversation we have been dying for them to have forever, he kills her with Excalibur. I nearly threw something across the room. No battle, an admission but no further discussion and no chance of it. I was sorry to see her go that way. Morgana was a complex character and a lesson in how circumstances can pile against you and the wrong advice, a lack of help, a building of fear and rage, can lead you to dark places. 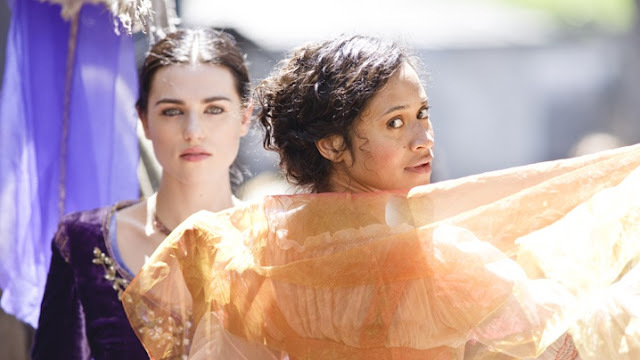 I wish they had done more; Katie McGrath was capable of it. In a final attempt to take Arthur to the lake, Merlin calls his ailing dragon Kilgarah to fly them to the lake. Kilgarah does so as his last act of friendship to the young warlock, but tells him that Arthur’s time is done. That there is no saving him. The dragon leaves to presumably die very soon. Merlin, devastated, holds Arthur as Arthur tells him that he is the best and bravest man he’s ever known. That Merlin should never stop being who he is and doing what he does. And then Arthur dies. It was always going to happen, but when it does, it’s heartbreaking. 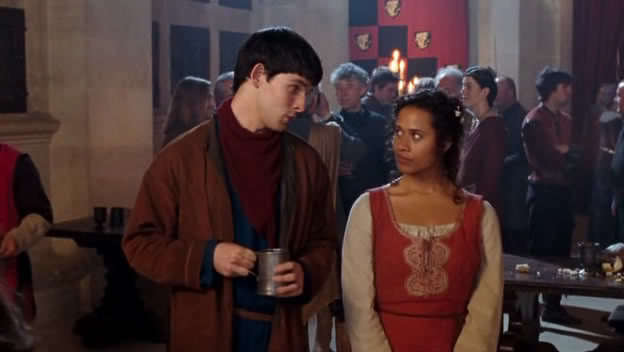 He asks Merlin to ensure that Gwen takes over as the Queen of Camelot and his successor. Gaius, back at the castle, reveals to Gwen who Merlin truly is, and her acceptance and comfort perhaps foreshadows the woman and Queen she will become, that we didn’t see. My only comfort in the fact that I didn’t believe the Albion story had come to fruition, was this notion that perhaps Arthur had to be King in order to marry Guinevere, die and have Merlin’s magic revealed to her, so that she could then complete his bid for unity and peace, but with magic. That’s a cool interpretation. I am going with that. Merlin gives Arthur a burial at sea, the hope given him by the Dragon that Arthur is the Once and Future King, and when he’s required again, he will be called. Epilogue: annoyingly, an old Merlin is seen walking in the modern day, past a truck, looking on where Arthur’s body lays, the implication that maybe Arthur will be back in our time. I don’t like that. Pause before this bit and enjoy the flood of emotion at the end of a tragedy. A story about love, unity and hope, through magic and monsters and ending with the deaths of some, and the carrying on of others.